Next to your putter, vision is your most important asset on the course with sunglasses being one of the essential golf bag accessories. 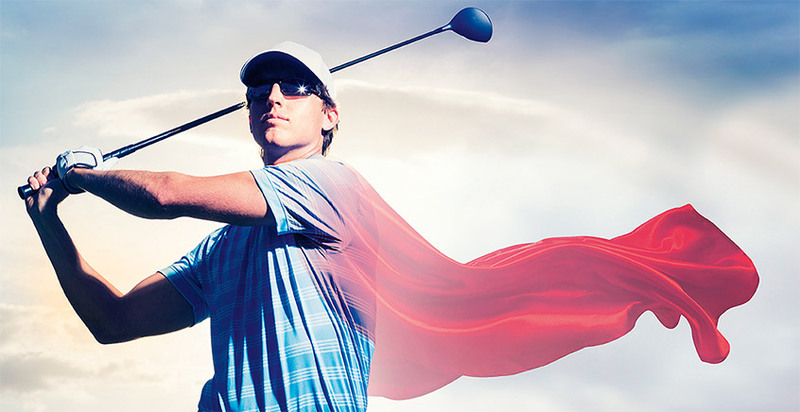 Sunglasses can significantly enhance your game by helping you to better study the green and allowing you to follow the ball as it flies through the air and across the fairways. For each weather condition, a specific lens colour will perform better than others, just as lens colour can impact performance in certain golf tasks. The effectiveness of lens darkness depends on the amount of sunlight present at the time. A dark brown lens is excellent for bright sunlight and helps you see the ball in the air, copper is good for medium-bright conditions and reading the green, a yellow lens is optimal for heavy cloud cover or fog, and photochromic lenses that adjust lens darkness are ideal to be worn throughout your game. The challenge is finding the best sunglasses that will address most of your golfing needs. Even then, players often take their sunglasses off to estimate a shot or swap between several sunglasses each time they swing or line up a putt. Despair not, there is a single sunglass solution. A lens that seamlessly changes to three different colours, optimising the eye’s physiology in varying light conditions. A lens that is photochromic to darken and lighten depending on the available sunlight. A lens that is polarized to block blinding glare. An ideal lens solution that in all weather conditions can take you from the car, to the green, to the late afternoon summer barbecue. Transitions® Drivewear® is the world’s only polarized photochromic lens that automatically changes to three different colours. It darkens and lightens according to the light conditions while also blocking harmful UV rays. Available in non-prescription and prescription, Transitions Drivewear can be fitted into many sunglass frames or you can buy ready-made non-prescription sunglasses. Developed by ophthalmologists and optometrists in the US, Transitions Drivewear combines two global leading technologies: Transitions® photochromics and NuPolar® polarization. Enhance your performance and get the edge with the SUPER VISION of Transitions Drivewear. Heightens contrast to easily follow the ball in the air against blue or grey skies and across the green and fairways. Provides excellent depth perception. Enhances contrast to more effectively read the green. Protects against bright sunlight. In bright sunlight Transitions Drivewear changes to a dark brown colour with a tint of 90%. Improves contrast on medium bright days to better see the ball against blue or grey skies and against the course. Enables you to better see contours and read breaks and grains on the putting green. Increases depth perception. Transitions Drivewear changes to a copper colour in the shade, in light overcast conditions and when driving. The tint darkens up to 75% tint. Heightens contrast in heavily overcast, hazy and foggy weather. Ideal for low light conditions so you can see more of your surroundings. In low light conditions Transitions Drivewear automatically fades to a yellow/olive colour with a lens tint of 63%. Lenses seamlessly change darkness based on light intensity. Tint darkens when the sun is bright and fades in lower light for visual clarity your entire game. Only one pair of sunglasses is needed throughout the day, even when weather conditions change hour-to-hour. Transitions Drivewear is powered by the unequalled world leading Transitions photochromic technology fading to 63% in low light and darkening up to 90% in bright light. Polarization cuts distracting glare to provide a more comfortable viewing experience. 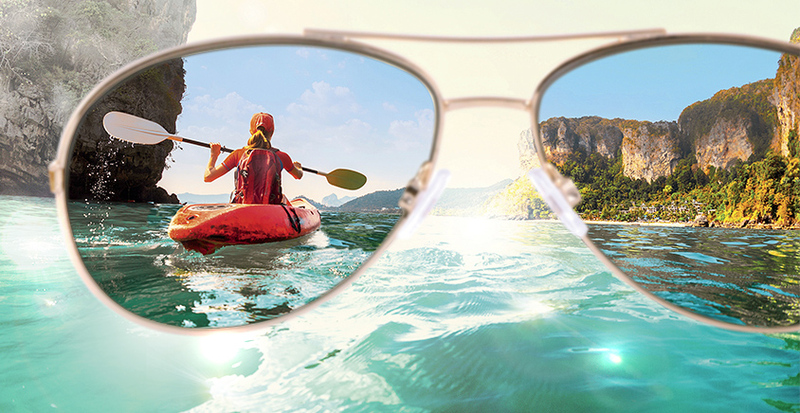 Polarized lenses enhance contrast for crisp high definition vision. 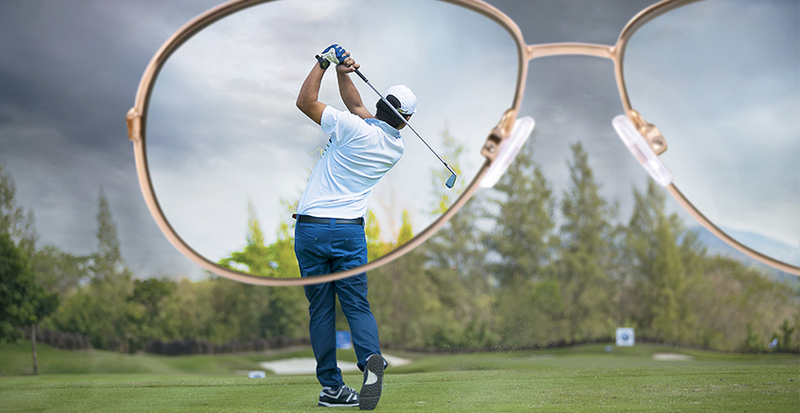 On very bright days, polarization blocks glare without having to wear a dark grey tinted lens which does not provide good contrast for golf. Eliminates glare off shiny clubs and water while trying to line up a shot. Transitions Drivewear features world leading NuPolar polarization. Tests prove no other polarized lens comes close to NuPolar in overall performance^. Lightweight Lightweight lenses are a must for maximum comfort. 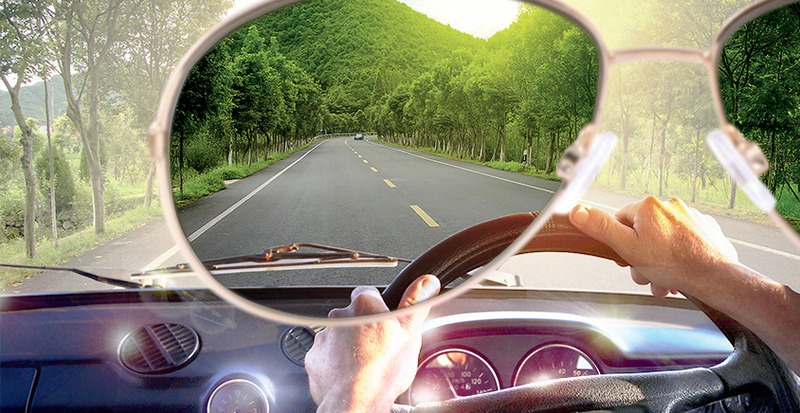 Transitions Drivewear lenses are made from lightweight materials such as Trilogy® Trivex® and polycarbonate. Impact resistance Resistant to impact so lenses will not shatter when dropped or if the wearer is hit in the face. Transitions Drivewear lenses are made from several impact resistant materials, including Trilogy Trivex and polycarbonate.